We're on a mission to empower people to love their neighbors! We want to serve more. We're on a mission to empower people to love their neighbors. 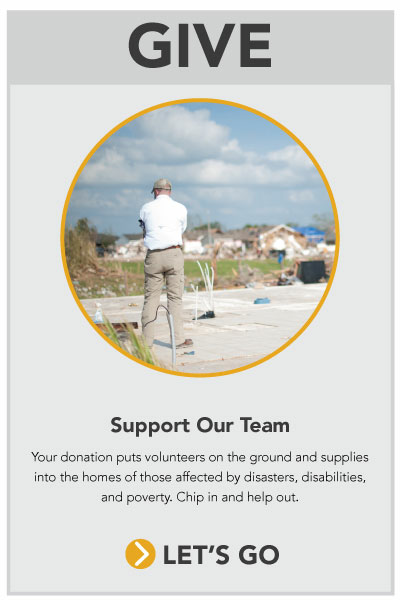 Serve More is an organization born out of disaster. Our story started the night an EF-5 tornado struck Moore & South OKC. In an effort to love our hurting neighbors, we organized more than 50,000 volunteers for storm cleanup. Since then, we've realized that many of our neighbors are suffering many kinds of disasters in central Oklahoma. The disabled neighbor unable to leave his home; the single mom unable to repair her rotting floor; the elderly woman facing citations for code violations — all these neighbors deserve our love and help. So we empower volunteers through training and tools to love their neighbors. We're working to be ready for the next disaster — whether that's a house fire, a tornado, a disability, or poverty. Serve More is on a mission to empower people to love their neighbors in central Oklahoma. Our goal is to connect people who need help with those who want to give help.